The global market for brachytherapy devices is anticipated to rise at a moderate rate in the upcoming years, which is mainly attributed to a growing geriatric population worldwide susceptible to chronic diseases and a significant rise in minimally invasive procedures. Brachytherapy devices are advantageous over radiation therapy equipment as they provide high precision for treatment of early-stage and smaller tumors, and also for the treatment of various cancers. This is because brachytherapy devices enable optimal placement of radiation source needed for high localized doses of radiation. Brachytherapy devices are preferred over other radiation therapy equipment for treatment of tumors, as patients treated using these devices have negligible probability of recurrence of the condition. Apart from this, less time needed for treatment, cost-effectiveness of brachytherapy, and efficiency factor of brachytherapy devices are acting in favor of brachytherapy devices market. Further, the growth of the global medical tourism industry is also having a positive bearing on the brachytherapy devices market. The rising prevalence of cancer and increasing application of brachytherapy for the treatment of other bodily disorders is predicted to fuel the market’s growth. 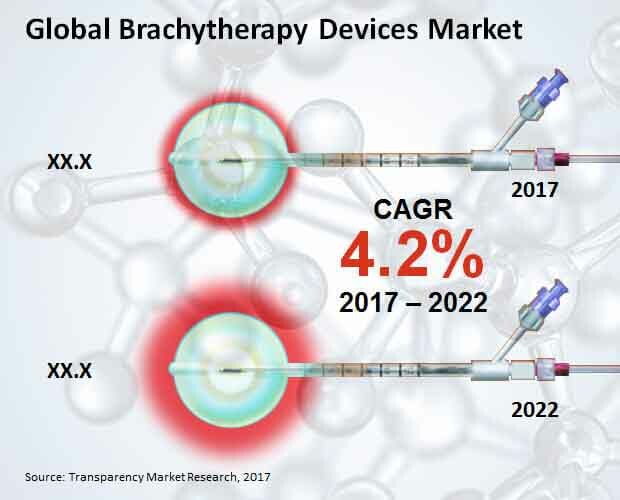 As per a report by Transparency Market Research (TMR), the global market for brachytherapy devices is predicted to rise at 4.2% CAGR between 2017 and 2022, for the market to be worth US$383.7 mn by the end of 2022. The report studies the brachytherapy devices market in terms of technique, end user, application, and region. The segments into which the global brachytherapy devices market is segregated in this report based upon technique are high dose rate, low dose rate, and others. Of them, the segment of low dose rate technique is anticipated to be worth US$167.4 mn by the end of 2017 to represent 45.7% of the market. Expanding at a CAGR of 3.9% between 2017 and 2022, low dose rate technique of the brachytherapy devices market is expected to be worth US$202.9 mn by 2022-end. The low dose rate technique segment of the market is displaying a year on year growth of US$7.1 mn, which is larger than the absolute growth displayed by any other segment. In terms of end user, the report divides the global brachytherapy devices market into hospital, oncology treatment centers, and others. The segments into which the global brachytherapy devices market is divided depending upon application are cervical cancer, prostate cancer, breast cancer, skin cancer, and others. The key regions into which the global brachytherapy devices market is divided in this report are North America, Latin America, Europe, Asia Pacific except Japan, the Middle East and Africa, and Japan. North America brachytherapy devices market is anticipated to lead the overall market vis-à-vis revenue by the end of 2017, and the region is expected to hold on to its dominant position until the end of 2022. The TMR report projects North America to be the most attractive regional market for brachytherapy devices, which is likely to expand at a CAGR of 4.7% between 2017 and 2022. Europe is another key market for brachytherapy devices mainly due to a modern healthcare infrastructure and an increasing prevalence of cancer. However, Japan is expected to display the second-leading CAGR of 4.2% between 2017 and 2022. This is mainly because of meticulous research for treatment of cancer and efforts for the development of equipment for the treatment of the condition. Some of the leading players in the global brachytherapy devices market are Boston Scientific Corporation, C.R. Bard Inc., C4 Imaging LLC, Cianna Medical Inc., Cook Medical Incorporated, Eckert & Ziegler BEBIG S.A., Elekta AB, GE Healthcare, Huiheng Medical Inc., Isoaid LLC, Olympus, Panacea Medical Technologies Pvt Ltd., Radiadyne LLC, Theragenics Corporation, and Varain Medical Systems Inc. The rising incidence of cancer is the chief driver of the global brachytherapy devices market. Brachytherapy devices limit the effect of radiation only to the diseased or affected body parts, in turn protecting the healthier tissues against radiation. The technique therefore offers a simpler methodology of cancer treatment using radiating therapy in localized doses. Besides being more willing to spend on advanced treatments, patients also prefer treatment options that pose lesser risk of side-effects. Owing to their integral features, brachytherapy devices make a hand in glove fit for catering similar demand. They ensure advanced treatment with lesser risk of side-effects. On the back of this, the global brachytherapy market will sustain a positive growth in the coming years. In the last few years, the number of patients availing brachytherapy has exponentially increased. This is attributable to the improved efficiency and shorter treatment time offered by these devices. Moreover, the global brachytherapy devices market is also expected to get facilitated by the cost-effectiveness of this treatment. The global brachytherapy market is forecast to exhibit steady growth in the coming years. The report covers various factors enabling growth in the market. It furthermore maps growth drivers and restraints influencing the uptake of brachytherapy devices across various end users. Furthermore, the report gauges various opportunities on the back of which the market will accelerate its pace in the coming years. To provide a more holistic overview the report therefore includes detailed market attractiveness analysis. It also encompasses opportunity map to present insights into the prevailing trends in the market and present refined outlook for the future. For the purpose of the study, the global brachytherapy market is segmented based on diverse criteria. Using proven research methodologies the factors affecting the market across these segments are studied in detail. In addition, the report identifies the most profitable segments within the global brachytherapy devices market, thus providing valuable recommendations to the market players helping them pick pace amidst a dynamic business environment. A detailed competitive analysis offered in the latter sections is intended at enabling readers gauge rivalry among the key market players. Prominent vendors are profiled in this section, which also includes analysis of the strengths and weaknesses of the key market players. Strategies adopted by the market players and the effect of the same on the overall market are studied. This, coupled with various other factors are taken into consideration to offer a holistic overview of the global brachytherapy market. Based on technique, the global brachytherapy devices market can be bifurcated into high dose rate and low dose rate. Of these, the market is forecast to witness higher demand in the low dose rate segment. In terms of end user, hospitals and oncology treatment centers constitute the key segments within the global brachytherapy devices market. By application, the market can be segmented into cervical cancer, prostate cancer, skin cancer, breast cancer, and others. Share contributed by each of these segments to the market is calculated. Furthermore, prominent trends influencing the market’s trajectory across these segments are studied in detail. Besides this, the report also offers regional analysis of the global brachytherapy devices market. North America, Europe, Latin America, Japan, Asia Pacific excluding Japan, and the Middle East and Africa constitute the key market segments based on geography. To gauge the prevailing competition, the report profiles some of the prominent companies operating within the global brachytherapy devices market. Boston Scientific Corporation, C. R. Bard, Inc., C4 Imaging, L.L.C., Cianna Medical, Inc., Cook Medical Incorporated, Eckert & Ziegler BEBIG S.A., Elekta AB, GE Healthcare, Huiheng Medical, Inc., Isoaid L.L.C., Olympus, Panacea Medical Technologies, Pvt. Ltd., Radiadyne L.L.C., Theragenics Corporation, and Varian Medical Systems, Inc. are among the companies profiled in the report.